The English Wilton Company is currently reproducing a c. 1900 brussels carpet runner for a house museum in Medford, Oregon. 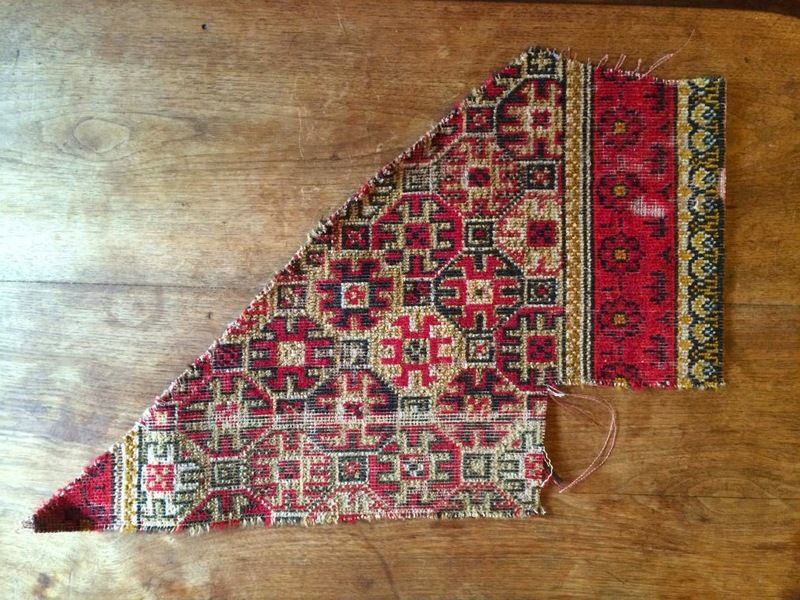 It's been an exciting challenge, as all that remained of the original carpet was a small, triangular fragment, discovered during renovations. 1. The medallions are identical on the extreme right and left of the field. 2. The pattern repeats every five medallions, and it does so by moving diagonally to the center and shifting down one medallion to restart. I made a crude mock-up, and sent it to our art department, who then created this CAD, which depicts the full pattern. Note that the background contains several colors not immediately discernible until one digs deeply into the pile. Now, we will send this CAD and samples of the yarn colors to the curator, who will assumedly approve them, and the weaving process shall begin. We plan on having this on the floor before the end of 2014, and hopefully have installation photos for you here. If you have a historic carpet that you would like reproduced, or even one you'd just like to know more about, please contact me here. President, Cooper Lace, Consultant on historic floorcoverings specializing in Wilton, Brussels, Axminster and Ingrain carpeting. Writer and lecturer on historic architecture, interiors and antiques.